Your computer is the equivalent of the twentieth-century stereo system — a combination tuner, amplifier, and turntable, plus all your records and CDs. If you’ve already copied your music collection to your computer, or if you use your computer as your main music-storage system, you can share that music with your Android phone. Over on the PC, an AutoPlay dialog box appears in Windows, prompting you to choose how best to mount the phone into the Windows storage system. Ensure that your phone is connected as a media player or uses something called MTP. 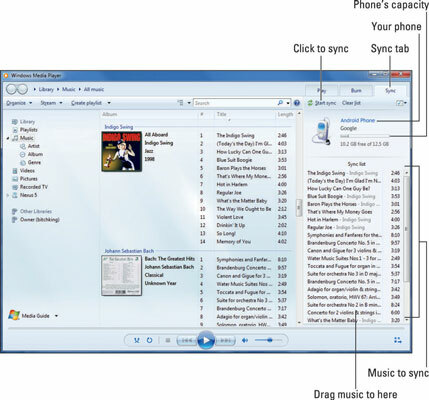 If an AutoPlay dialog box doesn’t appear, start the Windows Media Player program. Click the Sync tab or Sync toolbar button to view the Sync list. Your phone should appear in the list, similar to what’s shown in the figure. The figure shows a list of songs in the Sync list. To add more, drag an album or an individual song to the Sync list. Dragging an album sets up all its songs for transfer. Click the Start Sync button to transfer the music from the PC to your Android phone. The Start Sync button may be located atop the list, as shown , or it might be found at the bottom of the list. You can unplug the USB cable from the computer as well. If you need more information about the phone-to-computer connection. The steps for synchronizing music with other media jukebox programs work similarly to those just outlined. You cannot use iTunes to synchronize music with Android phones. On some phones you can copy music from a computer to your phone but then can’t find the music. That’s because a handful of phones don’t allow copied music to be played. In that case, only music you buy online can be played on the device.